After investing in a commercial painting service, you want the results to look beautiful for many years. Fortunately, there are several things you can do to protect the fresh look of a professional paint job. Begin by annually inspecting all interior and exterior walls, ceilings, and trim. Unsightly encroachers often remain hidden while they spread beneath layers of paint, eventually showing up as stains and discoloration. Protect exterior paint jobs by keeping trees, shrubs, gardens, and lawns away from the side of the home. Contact a painting contractor to apply a protective mixture when mildew makes its appearance. Protect interior walls and ceilings by immediately responding to any spills, leaks, or flooding. It’s much easier to repair small areas of damage than to address an entire wall of peeling paint. For example, you could fill in cracks around doors and windows with exterior caulking. Small spots inside your home could be touched up with a bit of leftover paint. 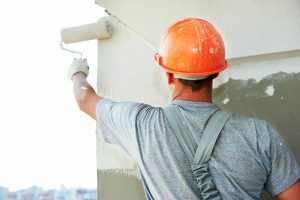 When large areas have been affected, such as the damage caused by the backs of chairs or large sections of paint that have been peeled off, it’s best to contact your commercial painting experts to ensure continuity in coverage and color. Dirt and debris affect both exterior and interior walls, eventually taking a toll on paint colors and brightness. When dirt is allowed to remain on painted surfaces, it provides an ideal situation for mold growth. As paint weathers, it may release a chalky substance, resulting in a faded, unattractive appearance. Regular cleaning can prevent these situations. On the interior walls, you may wash with a mild detergent and soft brush. Avoid using harsh cleansers. Exterior walls can be power washed. However, take care not to lift the paint. If you’re not confident in caring for a commercial painting job, contact professionals in your area. Home improvement professionals often have training and equipment to deliver top-quality results in a timely manner.